There are so many nice things going on with this model, it's hard to decide where to start. To start with, this is an all plastic version of Isabella using parts from the Coven Throne and one of the new Eldar characters. It all fits together so perfectly, it makes me wonder if they even had to do any greenstuff work besides a bit of gap filling. The display base they guilt for her is really nice as well. 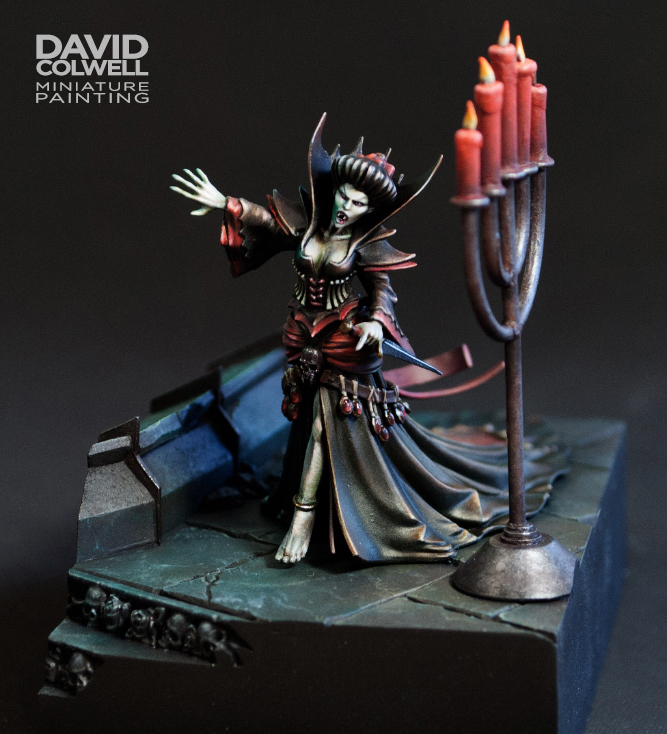 It's fairly simple and austere, but works great at providing a dark and macabre setting for her, while not overshadowing the models itself. I particularly like the use of some of the Coven Throne stairs at the front for the stairs on the hall. The painting is fantastic as well, with everything blended very smoothly and some nice crisp highlights to finish it off. The color choices of black and dark red for her do a great job at making her menacing looking while letting her pal skin pop and draw your attention. 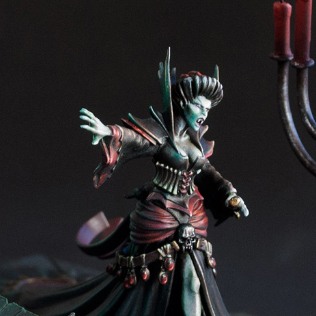 The use of a dark green on the marble of the base also contrasts nicely with the mostly red model. The most impressive thing though are the lighting effects. 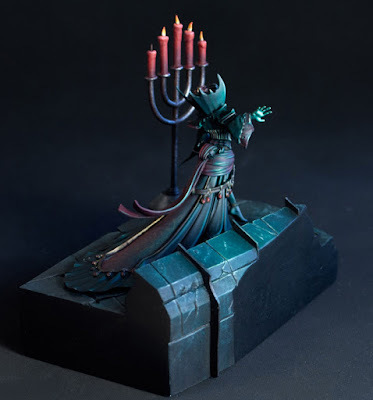 I love how they have managed to get the warm light from the candles on one side of her, and the sickly, green magical light on the other side. It really makes you feel like she is in a physical space, especially how the trail of her dress gets fairly dark since it's not within the light from either source. All around I like this model a lot. It achieves so much and does a great job at capturing a particular mood and setting.